TROIS-RIVIERES, Quebec (CNS) — Auxiliary Bishop Pierre-Olivier Tremblay of Trois-Rivieres now is Quebec’s youngest bishop and probably the geekiest. On July 22, Bishop Tremblay was ordained at Notre-Dame-du-Cap Basilica, Canada’s largest Marian shrine, where the 47-year-old prelate has been rector for two years. At the shrine, Bishop Tremblay developed new ideas for evangelization and the role of the church in society. He continues developing the Assumption Festival, the formula adopted to refresh the traditional novena by incorporating art and music and boosting the role of laypeople. His reason: People no longer knew what a novena was. For a long time, he said, the Canadian national shrines have been places for groups of “already convinced” Catholics. “But now, society is changing, and the sanctuaries are becoming places of frontline evangelization,” he said, explaining his vision for the shrine. Bishop Tremblay’s appointment by Pope Francis was well received in Trois-Rivieres, halfway between Montreal and Quebec City where the St. Maurice and Becancour rivers enter the St. Lawrence River. He stood out as a hard-working, talented speaker, with a vision to build bridges with a Quebec society that has been at odds with its Catholic heritage for 50 years. During his episcopal ordination, a couple the bishop married — Patrice Bergeron, professor of theology at Laval University, and his wife Dominique — explained why he is both “worthy” and “fit” for the position. “He knows very well our cultural context, its missionary challenges, and the art to kindle leaders among the baptized,” Patrice Bergeron said. Born in France in 1970, Bishop Tremblay joined the Missionary Oblates of Mary Immaculate in the 1990s, before being ordained in 1999 in Ottawa. He spent several years working with young adults in Quebec City, where he founded Le Tisonnier (fire poker), a group where adults can meet even if they have issues with the church. He also spent a few years working in parishes in Chibougamau, Quebec, and Ottawa, Ontario. In 2010, he received a doctorate in practical theology from Laval University. Bishop Tremblay became emotional during his episcopal ordination when Bishop Joseph Luc Bouchard of Trois-Rivieres presented him to the assembly. Also co-consecrating the new bishop were retired Bishops Raynald Rouleau of Churchill-Baie d’Hudson, Quebec, and Martin Veillette of Trois-Rivieres, who ordained him to the priesthood. “We will be close,” Bishop Tremblay promised the assembly at the end of the celebration. “I chose ‘fire on the earth’ as my motto (Luke 12:49). “Some people asked me if I intended to be a pyromaniac bishop,” he joked before continuing. “We need fire. It’s the fire of God’s love. Jesus’ desire for a transformed world. It’s the Holy Spirit,” he said, stressing that it’s the role of Catholics to light the fire together. 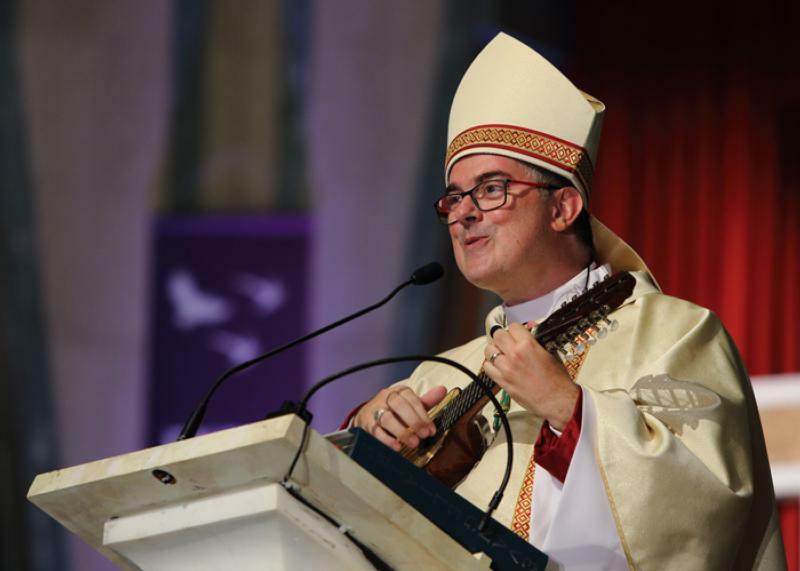 Bishop Tremblay then took out his charango — a stringed instrument in the lute family — and concluded by inviting the assembly to accompany him in a song about changing the world through love. Vaillancourt is editor-in-chief of Presence info, based in Montreal.